It’s always nice to come upon a film one had previously been unfamiliar with and realize it’s actually a little gem. British crime and noir movies can be more of a mixed bag than their US counterparts, or at least it sometimes feels that way. Nevertheless, there are plenty of high quality examples to be found and The Small Voice (1948) is one of those. Tight, compact dramas, those which maintain a sharp pace and ensure the plot remains focused, appeal to me and I’m forever on the lookout for a new one. This ticks the boxes for me, featuring enough depth and emotional complexity to hold the attention without slowing down the development of the story. Murray Byrne (James Donald) is a writer, and an apparently successful one. However, this success doesn’t seem to bring much joy as our first view of him as he’s riding a train back home indicates. He is gruff and brusque with an old school friend he happens to encounter and then continues in a similar vein with his wife Eleanor (Valerie Hobson), who is also the leading lady in his latest play. In short, Byrne is an embittered man, carrying the physical scars of his wartime experiences,, and clearly suffering from a sense of inadequacy which has spilled over into his private life. The marriage is teetering on the brink with Eleanor having essentially decided she can no longer continue, and then they come upon the scene of car accident. Three court-martialed soldiers have escaped from Dartmoor, their violent break for freedom having claimed a number of victims, and it’s this unhappy couple’s misfortune to cross their path. The Small Voice, the title referring to the human conscience, is all about a gradual heightening of suspense, the tension growing as the character’s room for both physical and emotional maneuver is increasingly restricted. The meandering paths followed by the protagonists converge on a deserted rural road late at night, their various attempts to reach freedom (either real or imagined) in essence coming to an end as their immediate concern with safety draws them back to the Byrne home. And so begins the waiting game that will fray the nerves of all concerned, yet which will also hold out the eventual hope of redemption, albeit of the backhanded variety in one case, and perhaps the beginning of a kind of personal rapprochement. The film was the debut of Howard Keel (billed as Harold Keel) and he makes a strong impression as the leader of the fugitive trio, playing it tough and dominant throughout. Now that’s fine in itself, but Keel had something more about him – one can’t have a career which lasted as long as his without that of course – and imbued his role with an extra dimension, lifting it above that of the standard heavy. 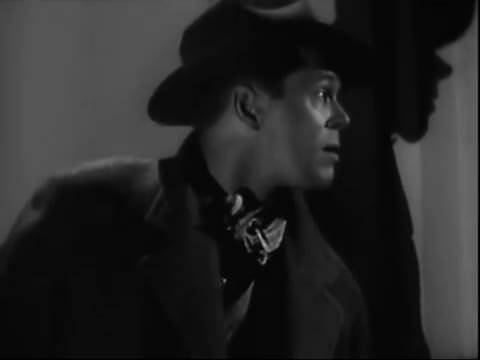 James Donald’s character refers to Keel on a number of occasions as “interesting”, which is an apt enough description of the role and the performance. Donald too is solid as the writer uncomfortable with himself and insecure in his marriage and masculinity. His buttoned up quality works well in this situation and his character’s journey is again an absorbing one. Valerie Hobson will probably always be remembered for her role in James Whale’s impish horror Bride of Frankenstein, but she was a class act in whatever part she played. She gets ample opportunity to show off her strength of character and also her depth and range as she tries to hold both her marriage and her very existence together. The Small Voice is the type of film which tended to get shown on TV in afternoon filler slots in the past, and then often drifted into obscurity in subsequent years. There was a time when these one-time staples of the schedules appeared more or less lost but have gained a most welcome new lease of life due to DVD releases by the likes of Network and Renown in the UK. The Network disc of the movie is a typically stripped down affair but has the film itself looking particularly well, and that’s surely the most important consideration. Personally, I had a very good time with this film can see myself returning to it periodically. It’s well made, atmospheric and brisk – I recommend giving it a look.